I am a sucker for education based projects - this one needs promoting a little. ScratchDuino a project from an international team out of Russia and Finland just launched a kickstarter campaign to raise funding for their highly customizable, simple and interactive open source robotics kits that uses an Arduino its brain and magnetic mount sensors. The project consists of two parts - the robot kit and the laboratory. 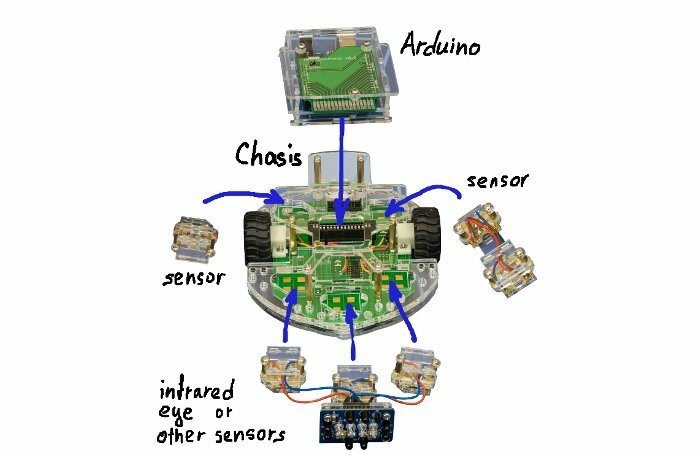 The robot kit has an Arduino at the center, with a custom built shield for interfacing to the magnetic mount sensor bus to obtain information and issue commands for navigation and movement - it is also open source so engineers can develop custom sensors for integration. The laboratory is more focused for education with integrated sensors such as temperature, light sensor, linear potentiometer, buttons and a microphone and speaker with the ability to connect external sensors - much like the sensor tags from Texas Instruments and Broadcom. Instead of being forced to learn C and low level languages or hardware API's - both of the kits are targeted for young people without programming experience who wish to learn about technology. The kits are based on the Scratch Progamming Language by MIT. The ScratchDuino Robot Construction kit won Google Rise Awares in 2013 and 2014.